Check Out Our Holiday Programme! In order to meet the diverse needs of the people, we have developed 4 different type of curriculums. Each of the segment has its own emphasis, thus the training we offered will be different. 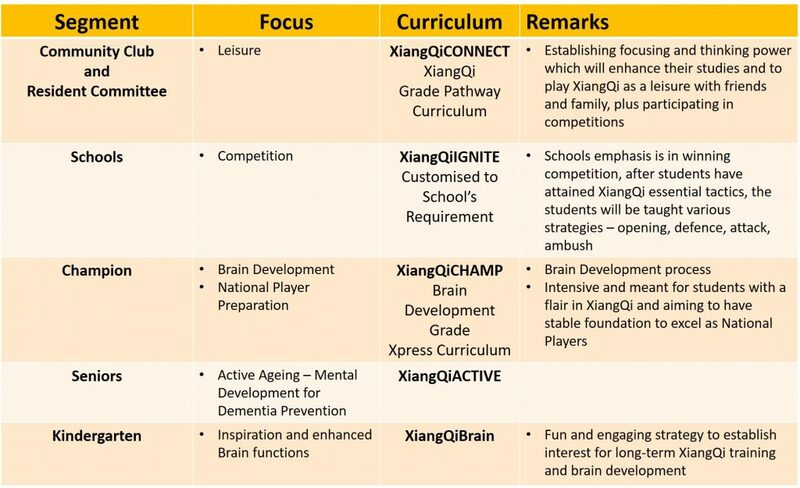 For example, at CC and RC, we have the XiangQiCONNECT programme which consists of 3 parts of 6 lessons to complete Grade 1. The objective is for students to be able to engage in a friendly match with their friends and family members. They can also participate in the various competitions we have each year. Once registered with our system, the student will be allocated an ELO Ranking score, and then they can monitoring their scoring after each completion. We have collaboration with the following CC and RC to provide XiangQi classes near their residents. If you want to have a XiangQi class at your CC but they do not have, you need to gather few others with the interest and approach the CC to start one. This will be the much easier way for us to bring XiangQi to your location because CC will only start class if there is a demand from their residents. XiangQi is an International Mind-sport and like any sports, it requires proper systematic training to increase the proficiency of the players. 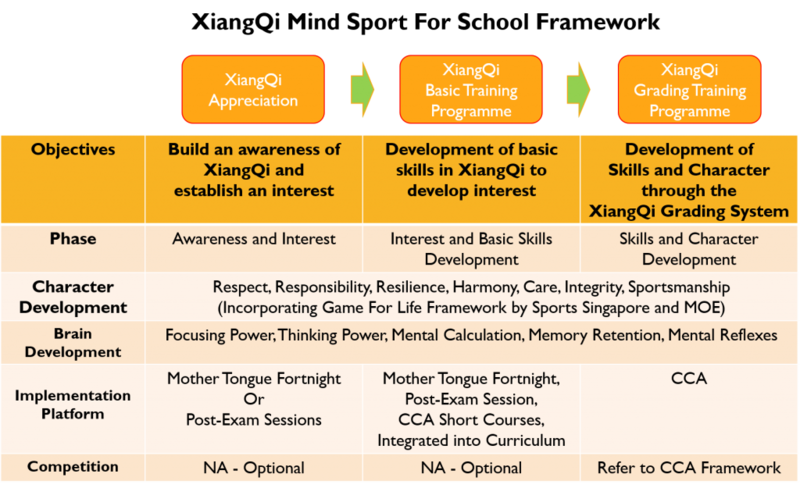 We have designed a 16 Grades Curriculum which will systematic allow player to build strong foundation and excellence in XiangQi. The curriculum is designed to allow newbies to build strong understanding of the various roles of the seeds and various strategies to adopt for Opening, Mid-Game and Closing. Grade 1 to 8 consist of 8 lessons each, while the more advance stage from Grade 9 to 16 consist of 15 lessons each. The course will come with Textbook and a Workbook for students to exercise what they have learned in writing. Upon completion of each Grade, students will need to take an assessment and be awarded a Certificate of Completion upon passing the assessment. Competition is an integral part of learning and we hold 2 competitions per month to allow our students to apply what they have learned into practice, and also to provide them with their ranking score, so that they know how well they have progress.